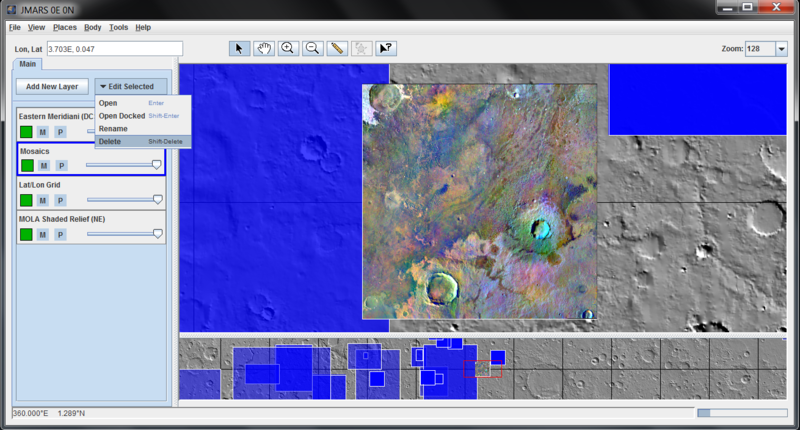 The Mosaics Layer allows users to view regional image mosaics in JMARS. The only mosaics currently available are THEMIS VIS, Day IR and Night IR mosaics, but this will be expanded to include mosaics from other instruments as they become available. Most were originally compiled as part of the various research projects at the Mars Space Flight Facility and are now being made available to a wider audience through JMARS. 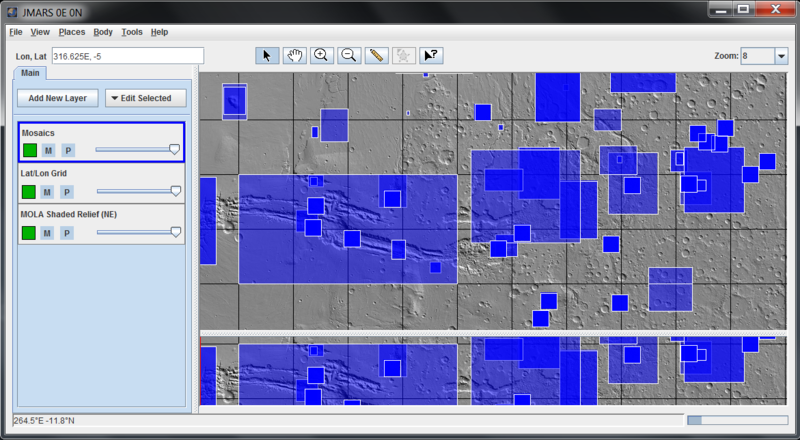 The Mosaics Layer is available in the Public, THEMIS and MRO releases of JMARS. Open the Layer: In the Layer Manager, chose "Add New Layer" -> "Mosaic Outlines"
Mosaic outlines will be displayed in the Viewing Window. 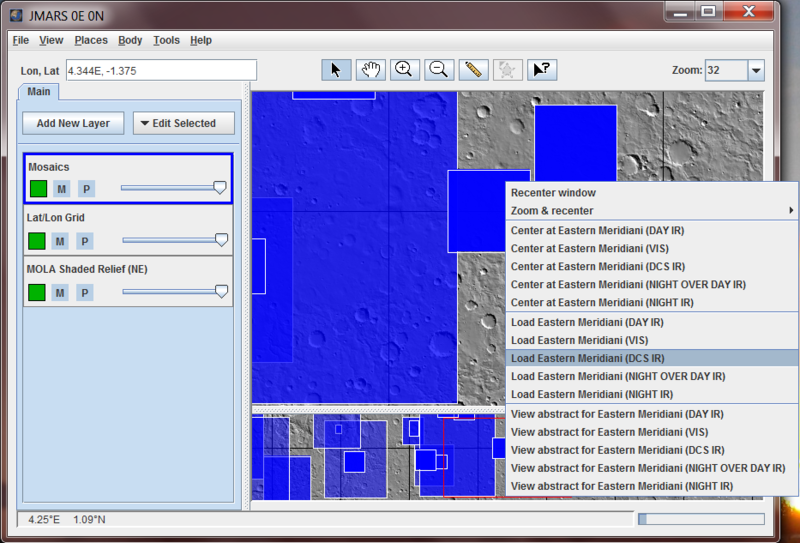 Load a Mosaic (from the Viewing Window): In the Viewing Window, right-click on an area covered by a mosaic outline and chose "Load Mosaic_Name"
If multiple mosaics cover the selected point, they will all be available as options in the right-click menu. 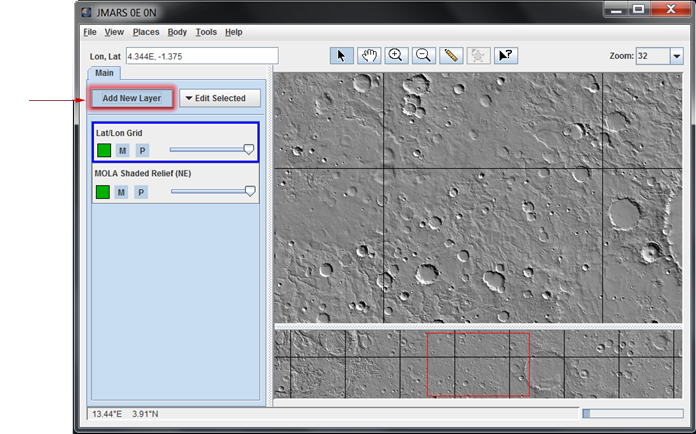 After a mosaic is loaded, it will appear as a separate layer in the Layer Manager. 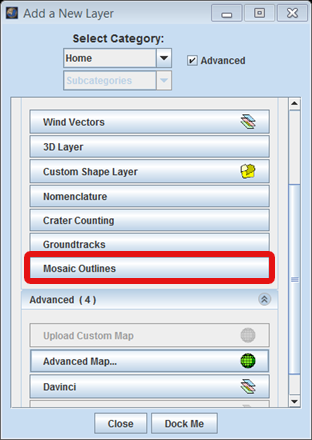 Load a Mosaic (from the Focus Panel): Double click on the "Mosaics" tab in the Layer Manager to access the focus panel, which contains a sortable list of all the available mosaics. Right-clicking on a mosaic name gives a user the option to either center the Viewing Window on the mosaic or load the mosaic. 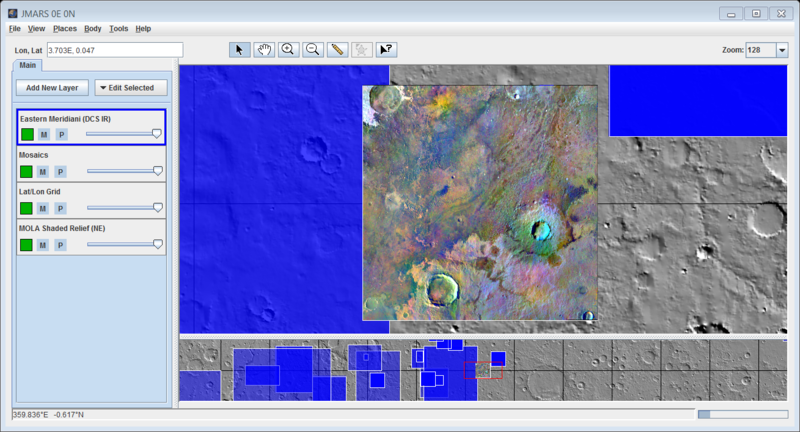 Remove a Mosaic: To remove a specific mosaic from your JMARS session, highlight the mosaic or layer name, click "Edit Selected" and then select "Delete"
An introduction to JMARS Video Tutorial: A further explanation on how to add and use layers.